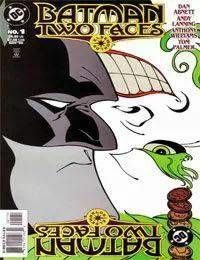 Batman: Two Faces is a DC Comics Elseworlds comic book, published in 1998. Written by Dan Abnett and Andy Lanning, with art by Anthony Williams and Tom Palmer. The story is based on the novel Strange Case of Dr Jekyll and Mr Hyde by Robert Louis Stevenson. A Victorian-era Bruce Wayne, tries to purge both his own evil side and that of Two-Face, while a serial killer named the Joker roams the streets. Batman: Two Faces is the prequel to The Superman Monster comic book.